Confucius said when standing on the top of Mt. Tai, you'll feel the earth become smaller. Since the Qin Dynasty (221-206 BC), Mount Tai, as the royal object of cult, was the venue where past emperors used to worship Heaven and Earth. Countless literati have left inscriptions and steles there, giving it the reputation as "A Natural Museum of History and Art". There are five famous sacred mountains in China - East Tai Shan, West Hua Shan, South Heng Shan, Norh Heng Shan and Central Song Shan. They each have their unique attractions. Even though Mount Taishan is not the highest mountain, it is the most famed of the five and symbolizes the Chinese Spirit. Since the Qin Dynasty (221BC-206 BC), Mount Taishan, as the royal object of cult, was the venue where past emperors used to worship Heaven and Earth. Countless literati have left inscriptions and steles there, giving it the reputation as "A Natural Museum of History and Art" of modern times. Located at the central part of Shandong Province and lying across Ji'nan and Tai'an Cities, Mount Taishan is the cradle of Chinese culture and the most magnificent mountain under heaven. With a height of 1,545 meters, its majesty and splendor is incomparable. It is mainly made up of natural sights as well as man-made sights. The intense grandeur from its mountainous bearing and spectacular breath-taking scenery exudes sheer elegance, profundity and immense vastness while touching on serenity merged with an air of mystery and tempestuous danger. There are five scenic areas on Mount Taishan - the Dai Temple (Dai Miao), the East and West Routes (Dong Lu, Xi Lu), the Mid-heaven Gate (Zhong Tian Men) - junction of the two routes, and the Jade Emperor Summit (Yu Huang Ding). East Route: "Serenity" characterizes the east route. It is the best option to take for a climb up Mount Taishan. Many cultural relics and historic sites bear witness of the past history. Attractions include Dai Zong Archway (Dai Zong Fang), the place where Confucius had ever visited (Kong Zi Deng Lin Chu), Jing Shi Valley (Jing Shi Yu), Hu Tian Pavilion (Hu Tian Ge) , Mid-heaven Gate (Zhong Tian Men), Five Pines Pavilion (Wu Da Fu Song) and Eighteen Bends (Shi Ba Pan). According to historical records, the Five Pines Pavilion is also called the Five "Dafu" Pines. 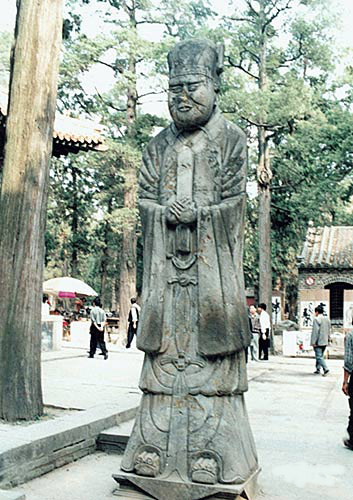 In 219 BC, when the first emperor Qin Shihuang was halfway down from the Mount Taishan it began to rain and he took shelter under the five pines beside five pavilions. Later, he conferred them the titles of "Dafu", the so-called "Five Pines Pavilion". The Eighteen Bends is a long and hard journey from Dui Songshan (Dui Song Shan) to Southheaven Gate (Nan Tian Men) in the Mount Taishan. It has three "Eighteen Bends" and 1630 steps. Seen from a distance, it would appear to be almost 400 meters up, vertically. One needs to be extra careful when climbing the steps. West Route: "Vastness" characterizes the west route, famous for its natural scenery. The winding highway forms the main path. Beautiful ridges and peaks form a silhouette speckled with long and narrow valleys, enigmatic and charming waterfalls and crystal-clear rippling streams. The International Mount Tai Climbing Festival is held there annually, and people from many different countries come to participate in, and enjoy the event. The main sights of the west route include Longevity Bridge (Chang Shou Qiao), Black Dragon Pool (Hei Long Tan), Remains of Tian Sheng Fort and Fan Cliff (Shan Zi Ya). The Black Dragon Pool is a recommended scenic spot along this route. There you will witness the waterfall flowing like a long white silk flying, as it pours over the cliff culminating into the Black Dragon Pool. Limpid, green water forms a very appealing sight, and mirror-smooth stones scatter around the area. Just imagine yourself sitting on the stones, absorbing the wonderful surrounding scenery while listening to the soothing sounds of the flowing water. An exhilarating treat for both the eyes and the mind! Mid-heaven Gate: With a height of 847 meters, the Mid-heaven Gate forms the crossing of the east and west routes. From this point, people can get a fantastic view of the mountain. On the east lies the pretty Mid-stream Mountain; to the west is the wandering Phoenix Valley; in the south is the wispy and misty Wen River and to the north is the hanging cloud ladder on the top of Mount Taishan. Cable cars and helicopters providing scenic trips for tourists are available there. Feast your eyes on the magnificent and towering splendor of Mount Taishan. Jade Emperor Summit: This is the highest peak of Mount Taishan. At the peak lies the Jade Emperor Temple (Yu Huang Miao), where a bronze statue of the Jade Emperor (the Chinese god) is worshipped. 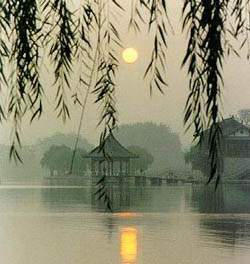 Enjoy the beauty of sunrise in the mornings in the east pavilion and the golden belts of the Yellow River in the west pavilion. The most spectacular feature of the Jade Emperor Summit is the carpet of snow - indeed a marvelous spectacle to behold. On Mount Taishan lie four wonders. The sunrise in the mornings is the most impressive and symbolic of Mount Taishan. Foggy clouds envelope the top of Tai Shan making it almost fairyland-like, instilling in one the desire to fly like a celestial being in the sea of clouds. Climbing the snow-covered Mount Tai is really a big challenge, but the scenery of the whole mountain with its unique charm makes it a worthwhile effort. The Buddha light shines on the top of Mount Taishan like a multicolored aureole, and people who are shined upon take it as a lucky omen of great honor. 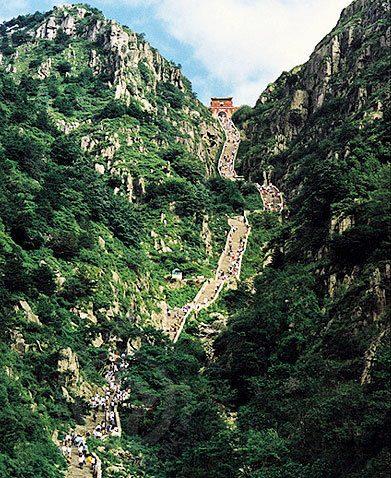 In China, we often use Mount Taishan to glorify a person's devotion to the country. Thus Tai Shan is of significant importance in Chinese minds.